Dallas-based nonprofit 29 Pieces is focused on the ability of art to have a positive impact on people's lives. Dallas, TX-based nonprofit 29 Pieces is focused on the ability of art to have a positive impact on people's lives. Last year it called on local citizens, students, organizations, companies, and artists to create 10,000 pieces of art inspired by famous quotes about unconditional love to be displayed throughout the city from International Peace Day on September 21 through the 50th anniversary of John F. Kennedy's assassination on November 22, 2013. AOR Nicole Communications promoted the project. "This collective public art project was conceived as a response to Dallas being labeled by some as ‘City of Hate' after Kennedy's assassination," explains Karen Blessen, 29 Pieces founder and artistic director. "We wanted to cover the city with art about love and get word out locally, national, and internationally about the project. PR was critical because the main intention was to change the narrative about Dallas." Partnerships were established with numerous companies and organizations, which helped produce and display the art. Media relations, events, social media outreach, and a dedicated website helped drive awareness and participation. "Dallas was planning a ceremony around the anniversary of Kennedy's assassination, which we knew would receive a lot of media exposure," explains agency principal Adrienne Hamilton. "So it was important to get the word out early about the Dallas Love Project, sustain momentum, and garner coverage." Dedicated Facebook and Twitter pages launched in early May. Updates about getting involved were posted regularly. 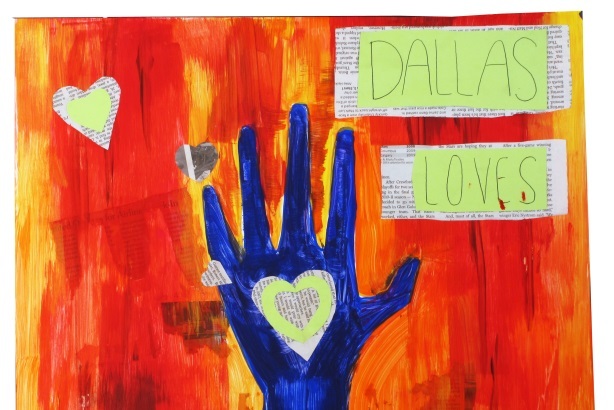 Website http://dallasloveproject.is launched in mid-May with information about getting involved, exhibits, events, sponsors and partners, and media materials. Media coverage and art created for the project were added as they became available. Blessen and three other staff members led free workshops on Monday nights from May through September 2 to teach more than 200 groups how to get their communities to participate in the project. The workshops were promoted through direct outreach to all former collaborators and friends of 29 Pieces. The project was announced to local and regional traditional media and bloggers, as well as to select national outlets including AP, in mid-June. Hamilton continued to pitch information about getting involved in the project through July. She also promoted "Walk the Motorcade Rally" events held July 20 and 27 in which volunteers asked businesses along JFK's motorcade route to exhibit the artwork. August pitches focused on fundraising efforts, including an August 15 party at Deep Ellum Brewery Company. Volunteers began installing the artwork on September 21. Pieces were displayed at 65 locations throughout the city. Local media and an AP reporter attended installations at Parkland Hospital and the Dallas Public Library on September 21. Blessen and students who created art gave interviews at both locations. Hamilton promoted installations at key locations, including the American Airlines Center and Dallas Love Field Airport, through November to media and blogs targeting local residents and tourists. The project drew participation from more than 20,000 Dallas residents, 120 local partner organizations, and at least 300 volunteers. "We expected around 60 partners, but that number doubled as the campaign progressed," Blessen says. "We were warned that volunteer numbers would dip as time went on, but those numbers increased weekly because people kept reading coverage about the project." Fifty-nine stories (nearly 185 million impressions) ran in outlets such as the Dallas Morning News, Austin-American Statesman, AP, The Wall Street Journal, Los Angeles Times, Fox News, Huffington Post, BBC News, The Guardian, and Agence-France Press. More than 334,000 Facebook impressions were garnered. Website and Twitter metrics were unavailable. Fifty pieces of artwork were donated to The Sixth Floor Museum's permanent collection. Additional pieces were donated to institutions such as nursing homes and prisons that house people who couldn't get out to see the installations. A party for donors was hosted on January 23, and about 120 pieces of the artwork were sold over the following two days to raise money for a forthcoming book about the project. A volunteer appreciation event will be held March 22. Blessen is in discussions with various organizations and civic leaders about expanding the project to other cities worldwide.